“Can you Guess?” was her response. And after the traditional schedule of announcements that the President would this week travel to Walter Reed, deliver remarks about Ebola, speak at the Business Roundtable, and attend the national Christmas Tree Lighting, right off the bat, Earnest was confronted about the President’s response to effervescing racial tension. “Does the President have a desire to travel to Ferguson?” went the first question. Later on, National Public Radio reporter Mara Liasson picked up on that refrain by asking “Could you explain the reasons why going now is not a good idea?” The White House took the occasion of Monday’s briefing to announce a $263 million dollar package that would fund police body cameras for local police departments across the country, which the administration again offered tepid support for. As the issue of Ferguson unfolded during the briefing, so did the issue of police using military retired surplus equipment, which has come under fire by Civil Libertarian activists as excessive. Twice during the briefing, Earnest pointed to the use of such equipment by the Boston Police Department in the Boston Marathon Terror bombing. However such actions failed to alleviate skepticism by the White House Press Corps “Why did it take a Ferguson to take the steps today?” asked NBC’s Chris Jansing. 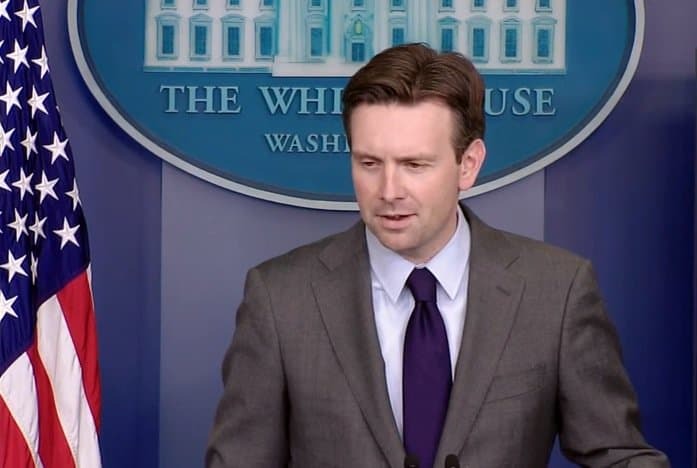 Josh Earnest will address the White House Press Corps tomorrow in the West Wing.